Confession time. I have one child that is a fantastic eater. NHL is eight and has almost always been good about eating fruits, vegetables, and other nutritious items. Sure, there was a small point in his toddler life that he refused a few things here and there. When he was little, he would order broccoli and mushrooms on a pizza as toppings. Yes, he would request broccoli as a side dish. Enter JSL, a four year old picky eater at best. Daily battles over what he can eat and what he will not eat happen. Where NHL will give things a “no thank you” try and usually like it, JSL will go on a hunger strike. His preferences will change from day to day, so TechyDad and I never know what preferences we will face. Chicken nuggets that he devours one day, may be tossed to the side three days later. We simply never know. We are able to get him to eat other protein sources. Nutritional drink supplements, cheese, PB, and sometimes Greek yogurt if we stand on our head. Where we get to a stumbling block are fruits and veggies. JSL will not eat grapes, strawberries, or most other items. While cherry picking, he ate some in the orchard, but declared they were gross afterward. Apples are hit and miss, as are bananas. About the only way he loves fruits are in a smoothie. We can do that from time to time, but they are not as easy to do on the fly. Vegetables rarely pass by JSL’s mouth in a whole or recognizable form. SERIOUSLY! He used to eat cucumbers and possibly some other items if we could bribe him. Not any more. We have attempted those recipes where you hide items in them, but they are quite time consuming thanks to making vegetable purees. Oh and most of the time he would not touch them anyway. While out shopping the other day, I needed some pasta. I usually purchase whole grain pasta since it is the healthier option. Something caught NHL’s eye. He saw the colored vegetable pasta from Barilla. I told him to pick one out. He selected the Piccolini that has zucchini and spinach. The other night, we made that with the Ronzoni Garden Delight we already had in the house. Both have a full serving of vegetables in each portion. What did the picky eater think? That photo above is JSL devouring the pasta. It may not be a solution, but it is a good alternative to have when we are going to serve the kids pasta. What food items do you battle with your children over or did you refuse to eat when you were a child? As a child I gagged on squash but now I love it! My eldest doesn’t really like vegetables and still doesn’t but he will take it if there isn’t anything else on the menu. I guess giving limited choice is what made him more receptive to it. My 5 yo will only eat corn. He won’t even try another vegetable – frustrating!! I love those pasta! Glad you found some that HE loves. Maybe you should let him shop with you and pick stuff upon the list? I’ve not had any battles with my kids in regards to eating…I make food, they eat or don’t. And when I was little I better eat what was there because there was never a certainty of something being there next time. JamericanSpice´s last blog post ..Drive Me Crazy! – Aloha! Luckily we have not had any issues with food… yet!! My kiddos have both gone through issues, but luckily they both love veggies, Nolan even loves asparagus! I have become a pro at serving meals- It’s almost like a game trying to get everyone’s preferences down. I’ve always pushed salads with my kids and to this day they will enjoy them. Certain veggies (the starchy ones) make no sense to me. Harriet´s last blog post ..Should she or shouldn’t she give it back? Ha ~ well my kiddies are now 31 and 32 and we have a new granddaughter too! Don’t remember many battles over food?? Guess it would have to be just trying to get them to eat more veggies back then??! They were both fairly good eaters. As for me ~ I HATED liver and Beets and our beautiful Mama thought we needed to eat them . . . Accckkkk!!! :-) Happy Aloha Friday to all! 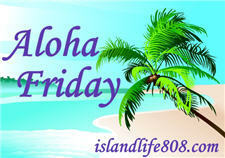 Ollie McKay’s Chic Boutique´s last blog post ..Friday is. . . ."Aloha Friday" time! As a child I was never that picky and ate whatever my mom fixed. When my kids were small, they had to eat at least a little of everything. Now that they’re grown, they don’t eat certain things, like my son likes his veggies raw and usually only eats cooked veggies if there’s melted cheese on top and my daughter doesn’t like anything with nuts. Hmmm…. We have quite a few food battles going on with our 2 year old. She refuses to eat anything other than carbs most of the time. No protein, no fruit, no veggies if she can help it. We have no idea how to fix it. That pasta is a good idea. I mean it’s not great but since the girl wants pasta all the time at least I can feel a little better when I give it to her, right? When I was a child I refused to eat vegetables . . . mainly cole slaw and leafy salads. My Mom never forced me and I learned to like them on my own.